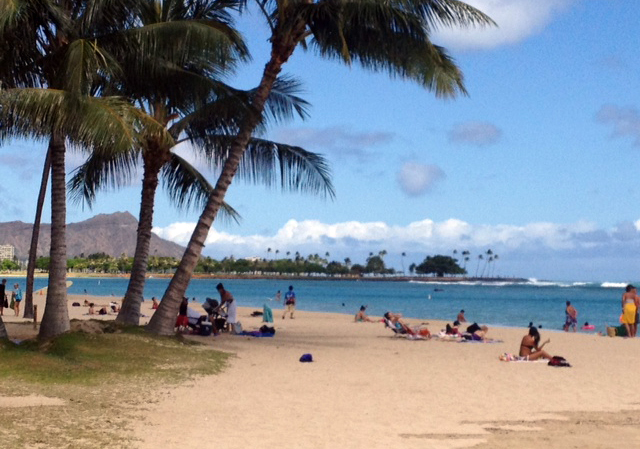 What a beautiful weekend in Hawaii nei? I passed by the pier and saw lots of boats so got motivated to go for a ride on the Red Sea boat this weekend. Everyone is always excited to go fishing and they all can't sleep the night before. After lunch while everyone is relaxing with no birds my port outrigger pole starts screaming! Strike #1..Everyone is shaken up looking at each other as the line peels out for what seemed like under 10 seconds then it stops. 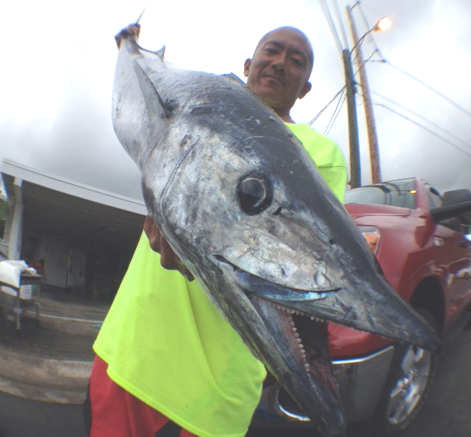 I knew it was an Ahi and wondered did it shake the hook? 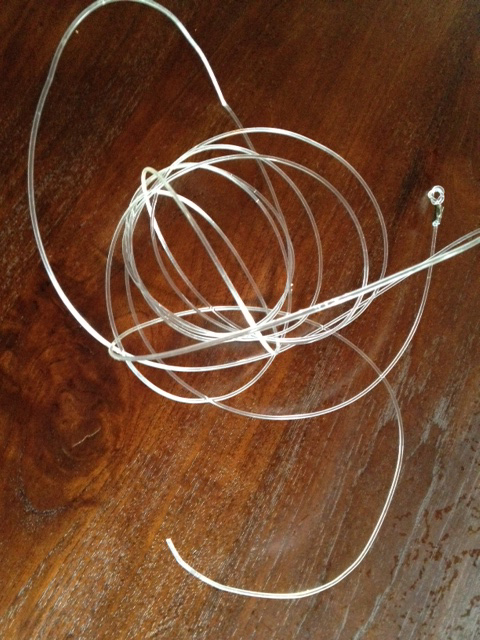 We pull in the line and to our amazement it snapped the line. It was such a rush for everyone and to see it live was awesome but unfortunately it's another weekend fishing tale to tell with no fish in the boat this time. I'm very optimistic with our first Ahi strike and waiting for strike #2. I feel good that our next trip out will be the one! I'm going to re-rig my same set up with heavier line so we don't strike out. Stay tuned! 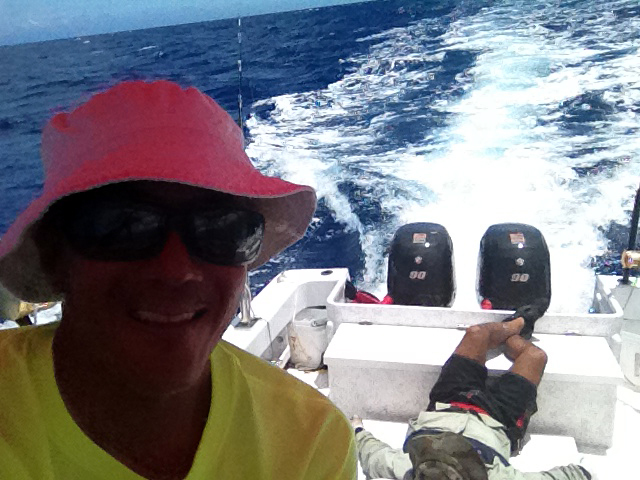 Today Kekoa and Al had the day off so we planned another fishing trip for the elusive Ahi. 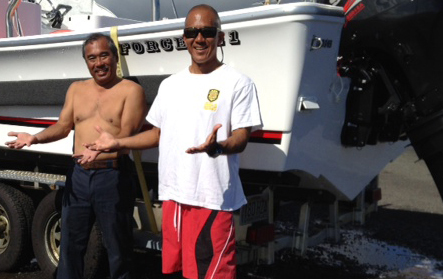 After a mishap at the ramp my boat suffered its first injury but luckily no one got hurt. The Red Sea boat is solid so checked it out and decided to go fishing. We made it out to the buoys found some bird piles and got another Ono strike on my same Gaji lure. 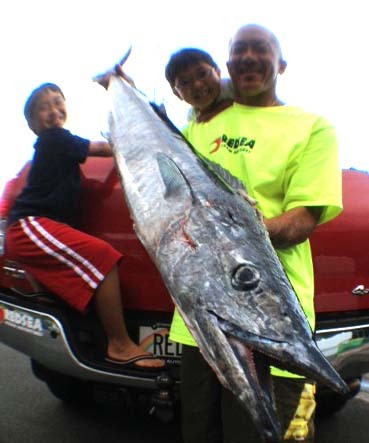 That lure has proven to be the Ono Candy and hope the Ahi's start biting it too. We were so hungry afterwards that we busted out the wasabi and shoyu and started the party on the side of the road. All my neighbors were coming home from work driving by in the afternoon and must have been thinking these fisherman are crazy! Well gotta go back to the store and re-rig my lures for the next time. 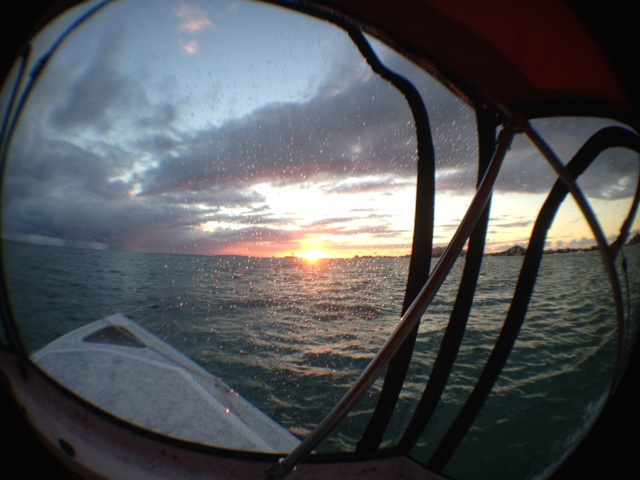 Thanks Kekoa and Al for a fun day on the water. 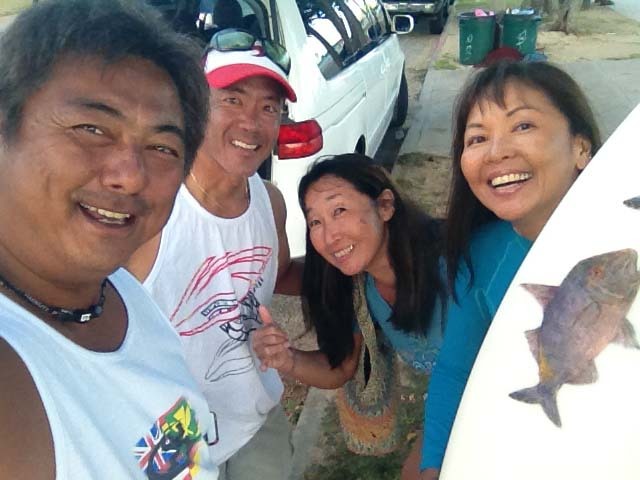 Was great to see our friends, Toda and Takami-san from Japan this week at the beach. They own a shop called Hula Hawaii in Fuji area and come often to restock their shop. 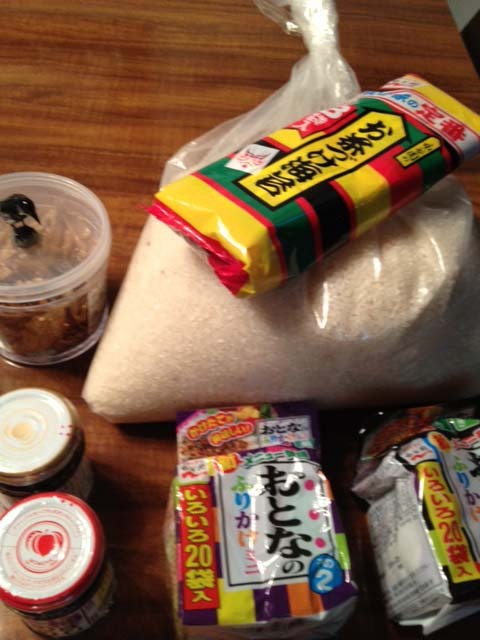 Arigato for all the oishi omiyage and treats for our family. We will enjoy them so much! Past few days have been surprised with a fun south swell bump that not to many people knew about. Waves were fun and almost looks a little like Indo? 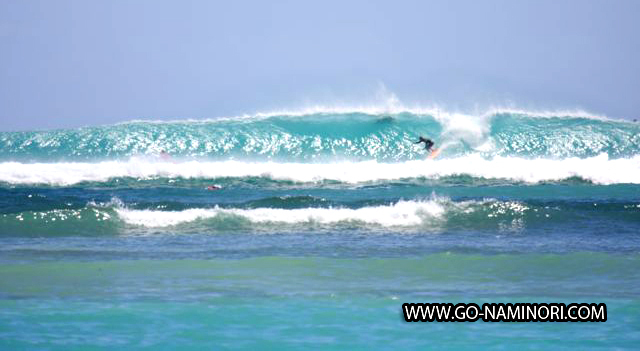 In fact this is Indo:) I think I'm ready for another surf trip! 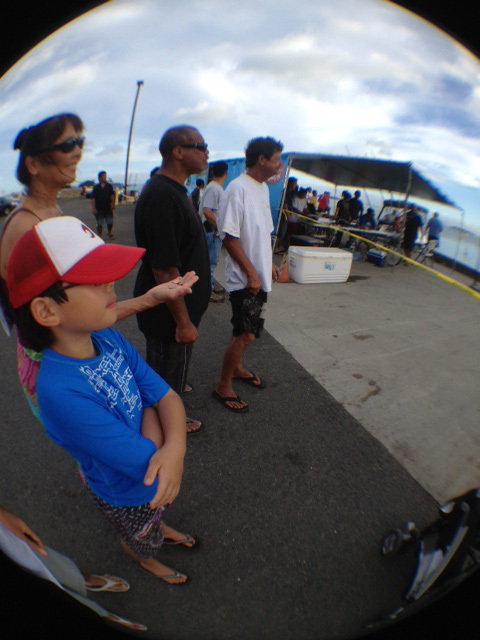 The Ahi Fever tournament finished up in Waianae and fishing catches was slower than expected but we still got the bug to go. Loaded up the Red Sea boat 5 am. and James and Alan joined me on another day of fishing. Winds were still up which made for a bumpy ride back but always nice to be able to enjoy the ocean. I've been learning alot about fishing recently and thankful for friends who are willing to share their knowledge and secrets with me. In fact I used to hate fishing because it would take to long for a fish to bite, I rather just go and shoot them. But now, as I get older I think I have little more patience than before. Happy Father Day! Hope all the dads are having a nice relaxing day. I watched the finals of the ISA surfing competition in Nicaragua where the best juniors in the world surfed for their countries. Here Team Hawaii anticipating the results. 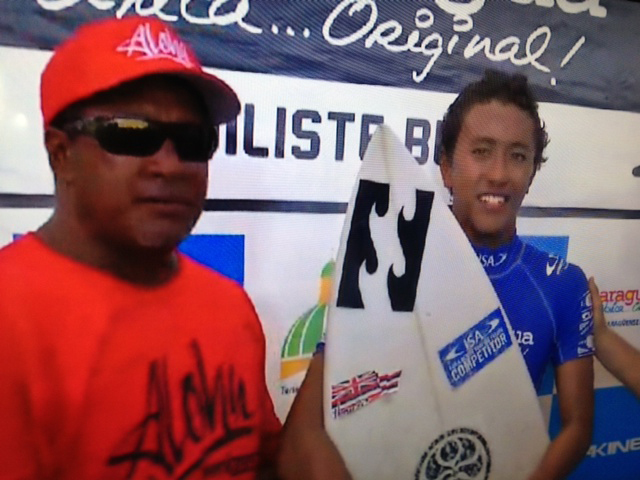 Big Congratulations to Josh Moniz who won his final heat (boys under 18) and brought home the gold medal for Team Hawaii. Josh is on fire and can surf anything from 2 ft to 20 ft. He and his brother Seth is the next generation of Hawaii's top surfers. Tony Moniz on left as a proud dad on this Fathers Day. 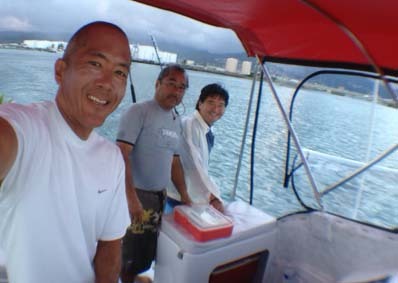 Well since I couldn't sleep last night and kept having fever, "Ahi Fever", I called up McGuyver James Oshiro and he was up to fish. But after the the winds picked up to 10-25 mph so he went down fast. See him manning his position while I entertain myself taking photos. He supposed to be looking for birds but instead he was catching a tan! ha ha! James is the best and he can fix anything except check his computer emails. He had to work early this afternoon so came in and washed up. Here we are holding up our imaginary Ahi. We are still learning the ropes and one day we will get that "monkey" off our backs with a big tuna caught on rod and reel. Until then we continue to dream and think big. 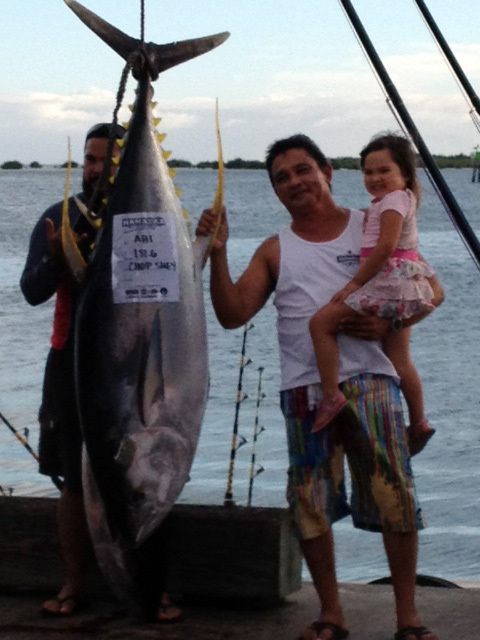 We did get a knock down and this 40 plus pound ono broke in my new reel and lure. It was a good fight and the reel even screamed for a little while. 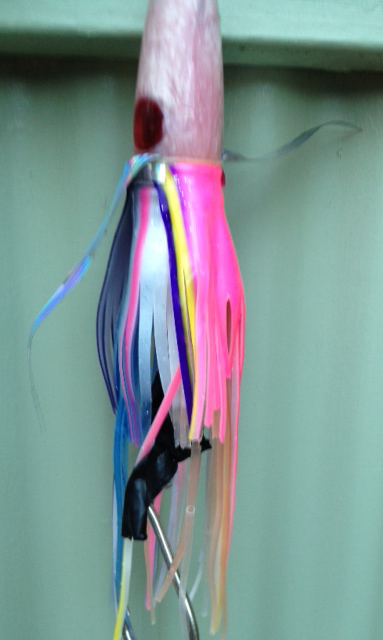 Check out my lure skirt I just made last night. The ono hit it and the skirt is shreaded. Its all worth it and will go and fix it up for our next outing. Oh oh! I think I may be infected? Well this past weeks south shore swell was as good as it gets. Everyone is surfed out and ready to relax and enjoy the weekend. The swell arrived Tues afternoon and peaked around mid day on Wed. It was a swell to be remembered by many as the best in 20 years. Good size, great direction, and good crowds means perfection. You can see on the bottom right of this picture (wet sand) how high the waves rolled up on the beach. I surfed out at one of my favorite undisclosed spots with a ten other friends that I thought we were on a boat trip or something. I was stoked to get some good waves and super lucky that Kirby Fukunaga got this shot of me on one of my waves. I saw him catch a bomb set and didn't come back out so I figure I'll catch up with him later when we go dive. But to my surprise he parked directly inside of the spot and pulled out his 400 mm canon camera and took this shot! Lucky me! Thanks Kirby for taking the shot! 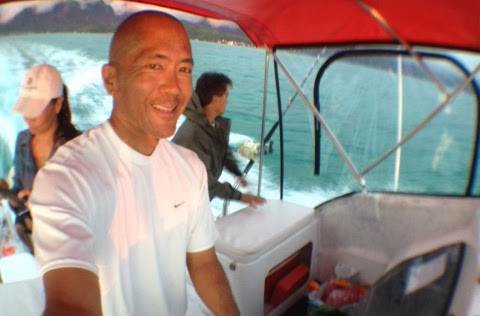 Well now that the waves are small its time to get ready for "AHI FEVER"! Remember that old show "Big Wednesday"? Where a bunch of friends are able to catch up when the swell comes in. Today was the best day thus far this summer! 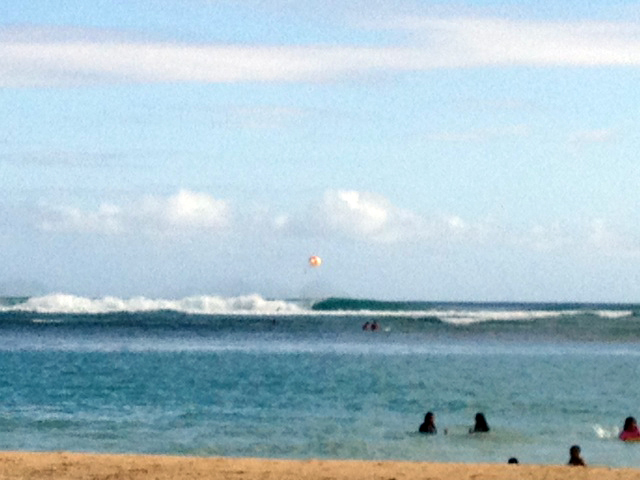 Fun double overhead surf with big barrels for everyone. I see all the regulars come out like Ronnie Yamada, Kirby Fukunaga, Nick Mita, Kylen Yamanaka, Kaito Kino, Ti Rez and a few other boys and we just take turns on the set waves every 10 minutes. Today I took out my bigger board so making the drops was easier. As the tide peaked at 3:00 pm the swell also peaked and probably heading down now, but still should have some left overs for tomorrow. Enjoy the summer! South Shore Swell No. 2 continues...Pulled up to my favorite spot, scored a perfect parking, and started to see some sets roll through. Waxed up my favorite 5'6" Kashiwai and paddled out to see only a handful of guys out. Score! Its fun riding small boards in bigger surf but there is risk of taking some late drops. This was my second wave and luckily I made the drop! Thanks Glenn Matsumoto for snapping these shots. Once I made it to the bottom I had to make it around the section and then the coast was clear! There should be more fun waves for next few days so everyone be safe and get barreled! South Swell no. 2 has arrived and everyone having lots of fun! 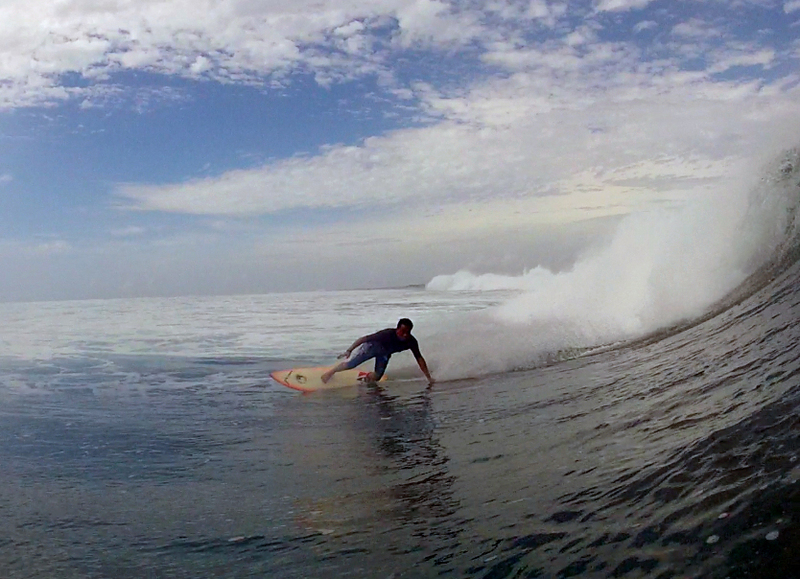 Here's a couple screen grabs from Jimmy Nakano's go pro cam from recent Fiji trip. Al Ah Nee dropping in on a set. Kekoa Mau, a different view. South Pacific continues to generate some amazing waves! The south swell we will be getting is but mere left overs to what is happening in Tahiti. This is what's happening at the end of the road. 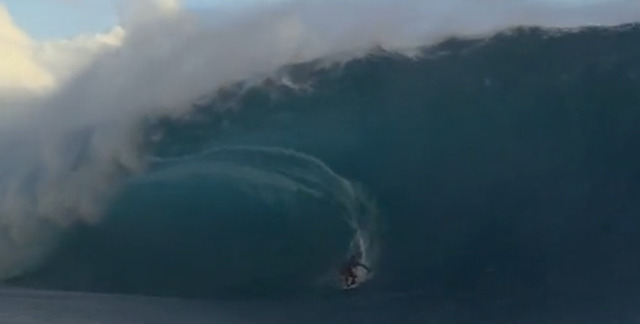 Click here to watch some "Crazy Surf"! 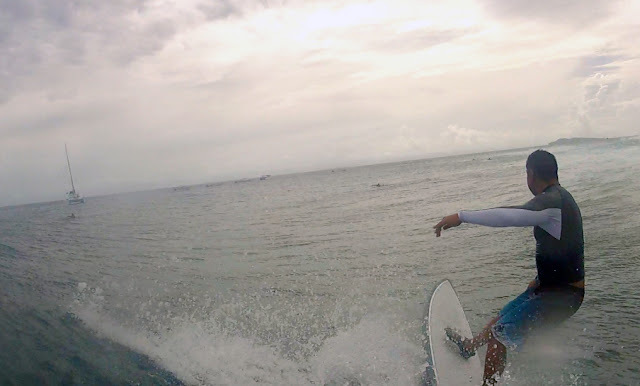 Fun waves today in Fiji with groms and pro taking to the water. Heard Kelly Slater missed his heat and Joel Parkinson also. Joel was out fishing and didn't make it back in time. Stay tuned for round 2! For me I will be waxing up for South Swell No. 2 coming tomorrow! See you in the line up. 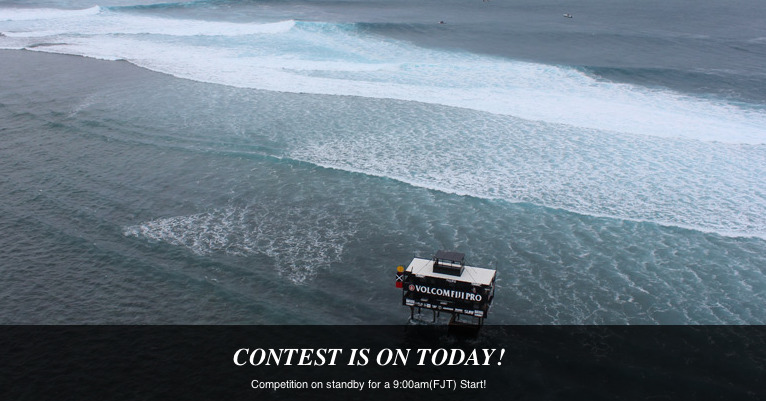 Volcom Fiji Pro 2013 finally gets underway today! One of my friends is a part of the film crew and stoked to watch all the pros in action. Tune into channel 1250 and watch it live! Vinaka! 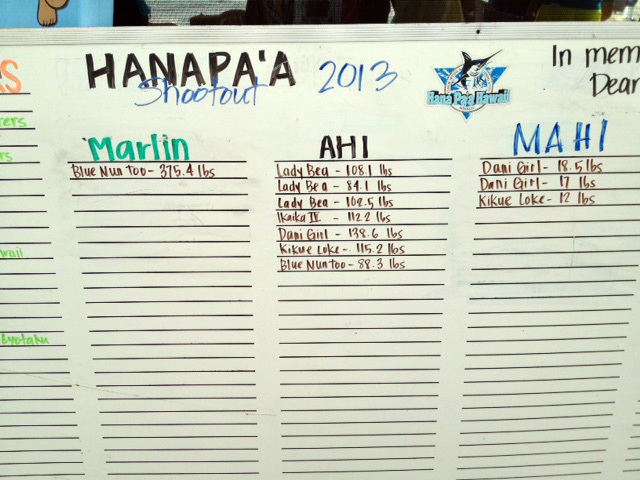 This weekend was the 2013 Hanapaa shootout! Total purse at $15k! 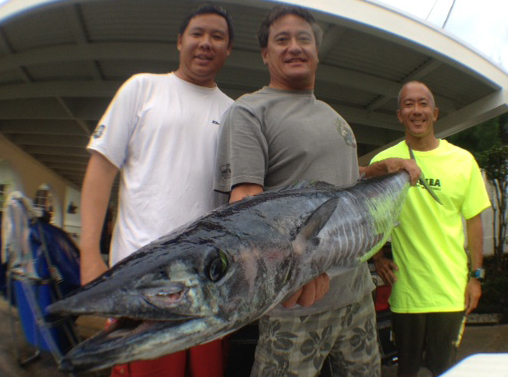 Lots of nice boats and Hawaii's top fisherman showed up for this big event. Ahi Season is in full swing and the fish are out there if you know where to look. This was the 2nd biggest Ahi that came up at 174 lbs. These guys were stoked! 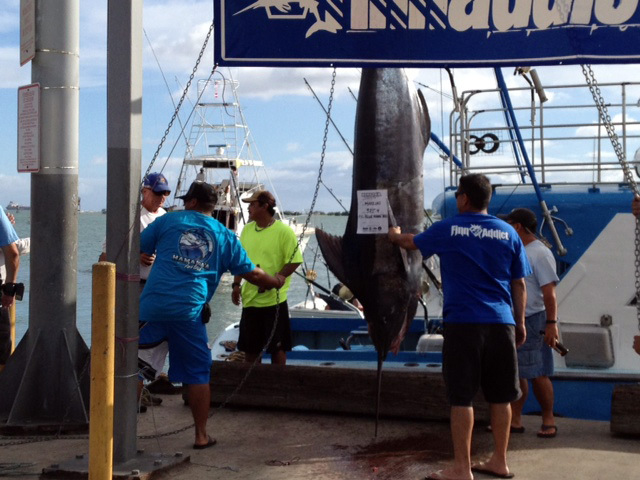 A couple nice marlin came up weighing in at 374 lbs. As the marlin hung upside down a whole aku fell out of its stomach. Lots of spectators in the house. These two men had a few beers and wanted to place bets with us on who could guess the correct weights. They took out their coins, 4 cents each and started betting! There were big boats coming in some around 50 ft long. 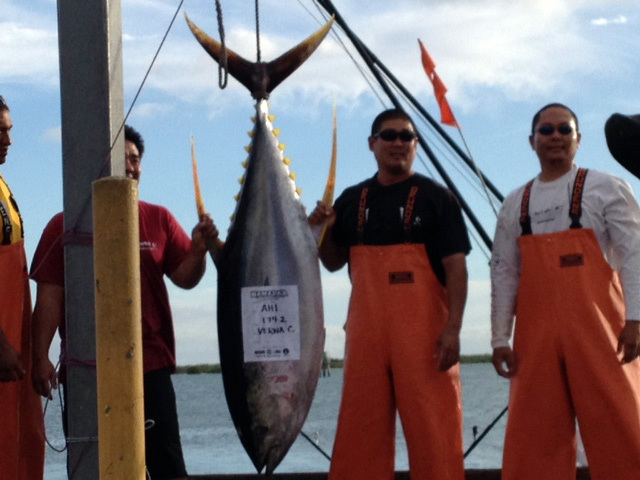 This guy had a 19ft glasspro and probably the smallest size boat but landed the biggest Ahi 188.6 lbs. He was a smile from ear to ear and it was so cool to watch as he carried his daughter up for the photo. 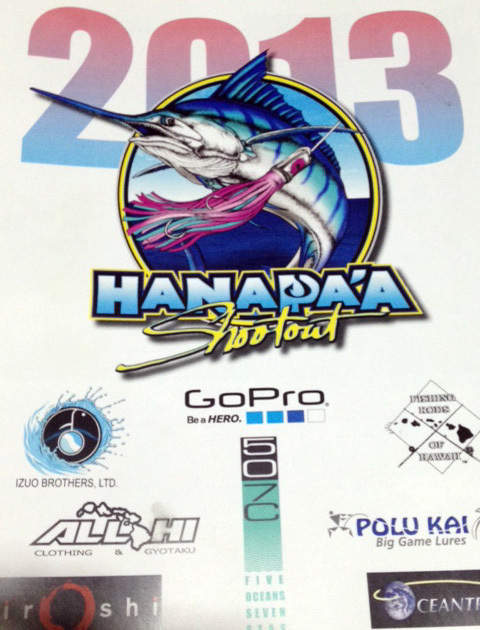 It was a great fishing tournament and hopefully someday we can enter one also. In the mean time we are going to practice to become better fisherman. One of my dreams is to catch a 100 plus pound yellowfin! Now I'm getting excited to go fishing!